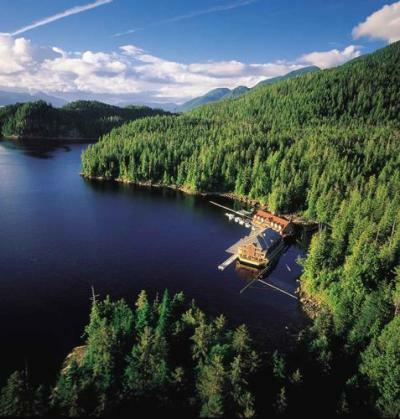 King Pacific Lodge, a floating luxury wilderness lodge located on the central coast of British Columbia deep in the Great Bear Rainforest, wants Canadians to make themselves at home this summer. And with half price lodging for the month of June 2012 for Canadian guests, a visit to the eco-friendly seventeen room lodge just got a whole lot more inviting. King Pacific Lodge, A Rosewood Resort, is offering the experience of a lifetime. During the month of June 2012, Canadians will pay 50% less for a visit to King Pacific Lodge, or $5,100 CAD, for a fully inclusive seven-night stay. King Pacific Lodge operates from June 1 to September 24, 2012. To learn more or to book a trip to King Pacific Lodge this summer, visit www.kingpacificlodge.com or call (604) 987-5452; toll-free (888) 592-5464. Source: SpectacularInk/Rosewood Hotels & Resorts.